One of the fundamental skills for teaching agility is teaching your dog to wrap an object. I’ve mentioned it before, and I’m talking about it again. My little Loki-pup can run awesome sequences because I first taught him to go around a pole. We used poles at the park, a bollard at home, possibly the leg of our island bench at one point. Then I started sending him out to the object, then we started connecting wraps so he was doing figure-8s. Before I knew it, he could do this! First, your dog needs to be a bit familiar with shaping. That means offering behaviours in order to get you to click & reward that behaviour. Hopefully you’ve done some shaping before, if not, do a quick google or youtube search – there’s heaps of info out there. If your dog is used to interacting with objects, then great! Read on. Choose an object your dog can circle – I listed some ideas above, but also a traffic cone could work, or a PVC pole in the ground on a long nail, or a pool noodle on top of a long nail pushed into the ground! Here is a video of me teaching Mallei how to do this. I haven’t done any shaping with him in a long time, and he wasn’t brought up with it the way Lu and Loki were so it usually takes him a while longer to ‘get’ things than it does with them. That being said he seemed to pick up the idea of this pretty quickly which makes me wonder if I haven’t done this trick with him before. The whole session went for 7 minutes, including when the other 2 dogs broke in and disrupted us for a few minutes. If it takes you more than one session, don’t despair. Sometimes it can take 3 or 4 before they’re fluently circling in one direction, and then you have to start all over with rewarding the other direction. 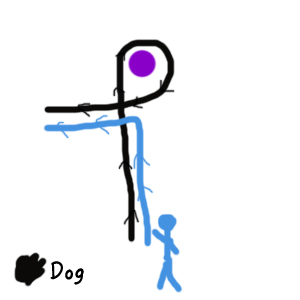 First, you want to click and reward your dog for any interaction with that object, though personally I would avoid clicking for them climbing on it or pawing it with their feet (I accidentally did this once and as a result got lots of pawing at it for the next few minutes). Reward placement is really important in making this easier for you and them, so try and give the dog the reward in such a place that will encourage them to take some more steps around or toward the object once they finish eating. And of course, you can use a favourite toy, or a handful of treats, or a fun game to jackpot any positive steps. It might take a few sessions but before long, you should be seeing your dog start to take steps around the pole. The hardest part for the dog is when it has to turn its back on you so again, reward placement is key! You can see this with Mallei in the video as he didn’t want to keep doing the circle and would often double-back so he could keep an eye on me. Don’t be tempted to lure the dog, but think strategically about where you can give the dog a reward in order to help it along and then, as I did with Mallei, push your dog a little by rewarding in a place that will mean he will have to have his back to you and move away from you in order to go around. If you always help your dog, they will have a harder time breaking through this point. Once your dog is beginning to circle the object, multiple times, in both directions and you’ve begun to name each direction (I have ‘cik’ and ‘tok’, some people have ‘cik’ and ‘cap’, some people have ‘check’ and ‘dig’ – choose what feels best for you, in what direction. I do it backwards to most people! ), you can start to send them from a step back, running off and ‘closing the circle’. Also, you want your dog pulling forward on his collar before you let him go and NOT relying on your movement to send him into the wrap. You want him to be looking for and going into the wrap by himself. Once he’s doing this, you can start sending from further and further back, and begin using trees! Then, once your dog can do all that, you can show him some wings and off they go! Will my dog enjoy agility?